The Skeptic's Field Guide: COMMANDER IN CHIEF ATTACKS? 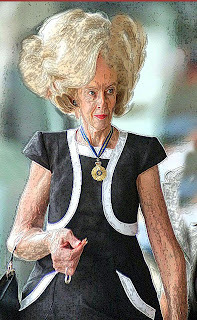 Under the Australian system of governance, the Commander in Chief of the armed forces is often an elderly, time-serving brown-nose with no military experience (see Quentin Bryce, pictured). He, she or it is known as the Governor-General. While Bryce could be shaping up here to lead an infantry section-attack on a Taliban observation post, I have my doubts. For one thing, I think the nail scissors in her right hand might be inadequate to the task. Roll on the republic - but please, no more crones.